If you want to know how to book IRCTC Tatkal tickets online fast, then you have come to the right place. But first a little background about this post. We enjoy traveling by trains, but sometimes are unable to plan, so one needs to book tickets in Tatkal on IRCTC website.Tatkal means quick, but booking Tatkal ticket online on IRCTC website is anything but Tatkal(quick). 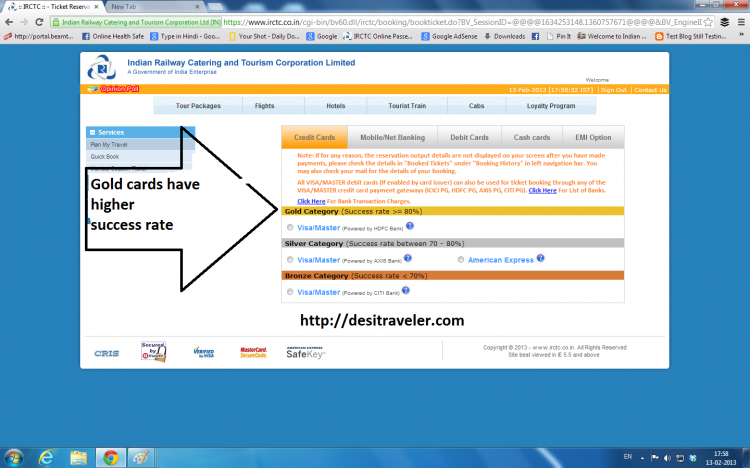 Recently I was very frustrated trying to book IRCTC Tatkal railway ticket online on IRCTC website. The site was slow, unresponsive and will keep on logging me out. Typically all the Tatkal ticket quota is finished in first 15 minutes once the booking opens, and by the time you log in again all the Tatkal tickets are gone. So I was very frustrated and tweeted if anybody has ever booked a Tatkal railway ticket by login to IRCTC site. A lot of people showed sympathy with me but Arti who writes the very popular My Yatra Diary blog responded back that she has booked the Tatkal train ticket online many time and suggested I log in to IRCTC 10 minutes before the tatkal booking start time at 10 am. This was a good sign for me and I tried the same and was successful in booking Tatkal railway ticket both for going as well as for return journey for my family over next few days. So here is a simple step by step guide to quickly book Tatkal railway ticket online on IRCTC website to increase your chances of success in those critical 15 minutes. First, a checklist before you log in and start the process of booking IRCTC Tatkal tickets online on IRCTC website. ID proof of the passengers. Remember for Tatkal train tickets you need to give the exact ID proof you fill at the time of booking to the TC in the train. You fill one that you will carry with you on the journey. Accepted ID proof documents for Tatkal tickets are Driving Licence, Passport, PAN Card, Voter ID, Govt issued ID, Bank Passbook, Credit card and Unique I-Card. Credit or Debit card or bank account details that you want to use for the transaction. You don’t want to rush to find out the same while the IRCTC website will happily log you out in the meantime. As per the IRCTC website, the Gold Credit cards have a higher rate of success for transactions, so if you have a Gold Credit Card you should prefer to use it. Keep the codes of the Journey start and destination stations ready. Since some of the big cities have more than one Train station you don’t want to waste time looking for the exact station. 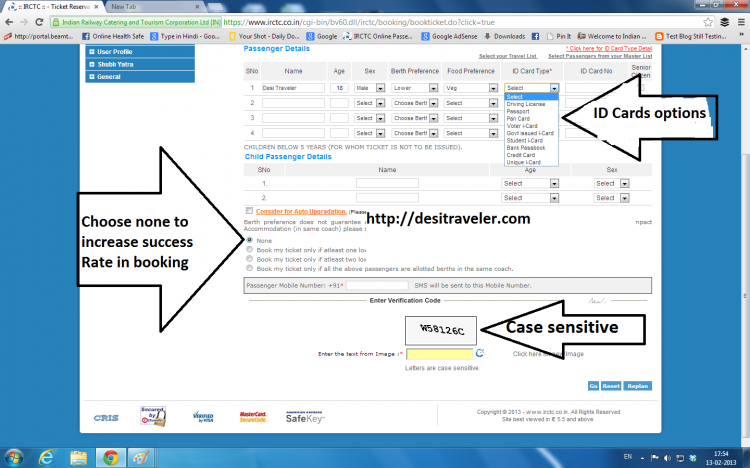 E.g, when you type, are booking tickets for Delhi you will get more than 10 options and not all of them are for Delhi. Also While your train may be going to Hazrat Nizamuddin station that has code NZM so you will not find it when you type Delhi. Hence, keep the station code ready and type it to speed up things. 4. Now login to the IRCTC website 10 minutes before the Tatkal online booking time of 10 am a day before the date of journey e.g to travel on 15th February you can book Tatkal train ticket only from 10 am of 14th February. 5. Once you log in, IRCTC will ask you for Name, age, food preference for the passengers. Either you can keep it typed in a notepad and copy paste it, or those of you who are more tech-savvy can use this online form in advance to fill the details. I prefer to fill manually by copying pasting the relevant details as I am not very tech savvy. This link will also give you an excellent video by Amit Agarwal of Digital Inspiration fame, on steps to book IRCTC tickets, but remember if you are not very tech savvy you should practice the steps mentioned to fill auto form well in advance to avoid last-minute learning. 6. In case you have filled Lower birth option then the IRCTC website will give you an option if you want to book tickets only if the Lower Birth tickets are available. My suggestion is to go with the option “None” as this will increase your chances of success to get a tatkal ticket. In case you are not comfortable with higher birth, you can always request some fellow traveler to exchange seats with you. If you choose book tickets only if Lower birth is available your ticket will not be booked when no lower birth is available while other births may be available. So don’t be too picky about the birth, just move on to the next step. Fill the phone number where you would like the text SMS for the ticket to receive. Remember you do not have to take the printout of train tickets in India as long as you have the text SMS from IRCTC on your phone. Don’t make any mistake while booking Tatkal tickets as otherwise, you will have to repeat everything. 7. This is a very important step as you will have to fill the image shown as CAPTCHA into the space provided. Now a lot of captcha images are not case-sensitive but in the case of Tatkal railway tickets booking online on IRCTC website they are case-sensitive so make sure you are using the correct upper or lower case. Speed and accuracy are of the essence in those 15 minutes when the Tatkal tickets are being lapped up by thousands across India and you do not want to make a silly mistake and miss on the Tatkal tickets. You don’t want to repeat the whole process by wrongly typing in lower or upper case. a) How many tickets can I book in Tatkal: Maximum 4 tickets can be booked in one session. d. I don’t have a computer and internet what to do: You can go to the nearest Railway booking center and get the ticket from the railway station also. e. I get error 503.What does error 503 means: It is not your fault, it means too many people are trying to login to IRCTC site and the website is unable to handle the volume, hence you are getting this error. You need to try to log in again to IRCTC portal. I want to end this post by thanking Arti of My Yatra Diary whose response motivated me to do the research. So dear reader whether you want to go to Pondicherry, The temples of Hampi or want to escape from Hyderabad, to go to Pench or Madumalai to watch wildlife, I am sure these tips to book IRCTC Tatkal tickets will help you. All the best for your Taktal Railways Tickets booking online on the IRCTC website. Do let me know about your experience by leaving a comment for the post. For those of you wondering where to go here is a list of places to visit that I suggest. If you have liked reading the post please feel to share it with your friends on Facebook, LinkedIn, Twitter and Google+. You can also subscribe to the email updates to receive new posts automatically in your inbox. I promise that I will not sell, rent, or donate your email to anybody. 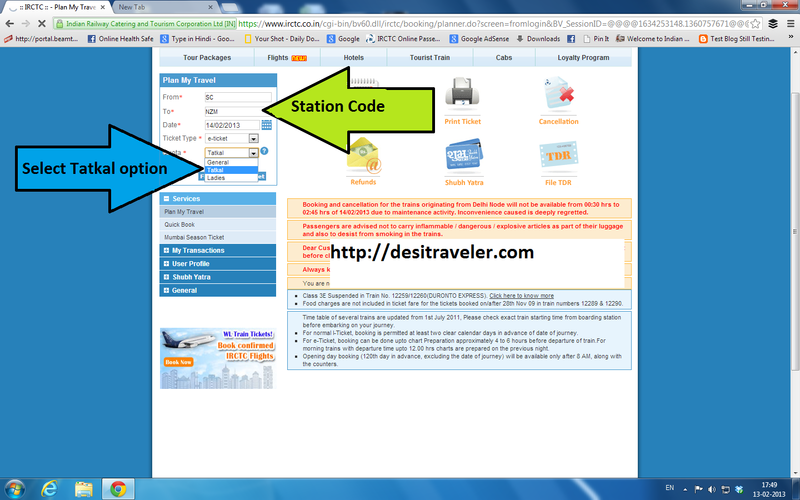 UPDATE: IRCTC has changed the look and feel of the site, but the overall functionality has not changed and these tips are still valid if you want to book your ticket in Tatkal on IRCTC website. Change in Tatkal policy and time to book Tatkal Tickets To ease the pressure on Tatkal booking servers, Indian Railways has decided to stagger the bookings of Tatkal tickets. Now for AC coaches the timings will be from 10 am to 11 am for tatkal booking, and for Non-Air-conditioned coaches the timings will be from 11 am IST. It still needs to be seen if this will ease the traffic as now everybody will be trying to book same class of tickets simultaneously. 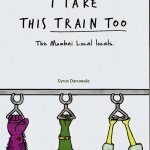 Thanks alot for sharing the usefull information, was trying to figure out how to book a ticket on IRCTC and this blog finally helped me. Keep Sharing such informative blogs, Thanks! IRCTC connect application is very quick to book train ticket from your smartphone. Website also work well but sometime faces server error. Overall its very easy for all to book train tickets online without contact any agents. Auto fill your IRCTC TATKAL Tickets with amazing speed. I want to book more than 20 normal ticket in a session is it possible to book ticket. 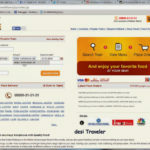 how to book tatkal ticket on one day advance? i am booking tatkal ticket bt its not booked there is some problem like a how to book tatkal and whats timing of tatkal ? Tatkal tickets are booked a day in advance the post has all the details the window for Tatkal opens at 10 am every day, you need to login a bit early as IRCTC site is very slow during tatkal booking hours. Hi, I want to book 10 tickets in advanced when booking start before 60 days so I can book 10 tickets by online. pls reply. I have dought about ticket booking, coould you please tell me maximum how many tickets we can book from one computer(means one IP address) per day.Hope this answer will be help ful to all readers. Thanks in advance. 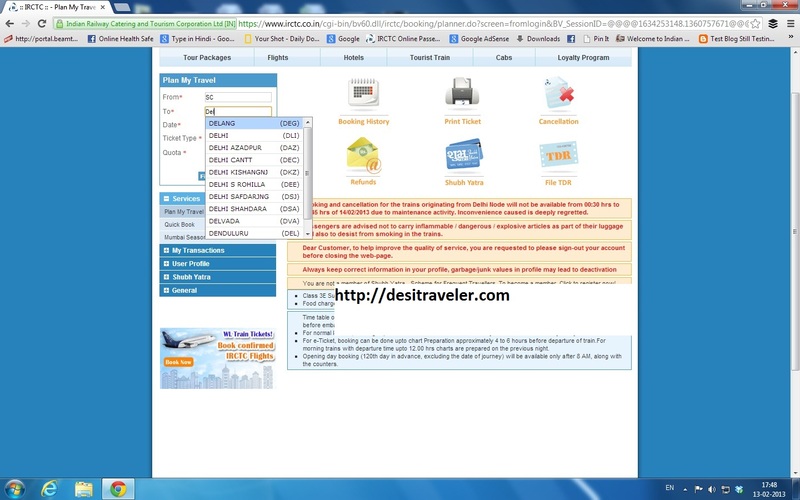 IRCTC has introduced several changes for booking Tatkal tickets on the internet. Individual users are permitted to book only two tickets from 10 am to 12 noon. Only two tickets can be booked from one IP address between this time. I have not tried it lately but each ticket can have 4 passengers, so it gives you 8 seats. Do inform me of your experience. Should not be a problem, just carry both when you are traveling… also no need to tell this proactively to the ticket checker. I have done same mistake. tell me if there was any problem? hi, my name is ajeet kumar sahu. I have booked a ticket through IRCTC using my own ID from bangalore city to New Dehli. I got RAC ticket and for same i got message in my mobile. My PNR no was 446-4323417 DOJ:16-07-14 RAC:5. But i could take hard copy now i want hard copy for same ticket for LTC claim in my office. They told me that mobile message is not valid for my LTC claim. So please send me ticket on my Email as earliest possible. I will be very great to you. Dear Mr. Sahu: No matter how much I would love to help you I can not as I do not have access to IRCTC site and your account. Please log in to your account and go into history tab. It will ask for your password again and then you will be able to get a ticket copy, that you can print. Also how come your email is Rahul if your name is Ajeet ? just wondering…. Your reply was very helpful and time saving, thanks for it. 🙂 You are welcome, glad to be of assistance. Thank you Mr. Prasad for the prompt reply to my 1st query. Actually I forgot to mention that in my proposed travel the return journey ticket, which is after 3 days, is not available under normal quota. So to book the return ticket under tatkal scheme, what is the procedure? OK, if you want to book that in return Tatkal you need to wait for the one day in advance. So if your return is on 25 June, you can book it only on 24 June, unfortunately that is the only way to book Tatkal ticket. How to book the return journey ticket, if the onward ticket is booked under tatkal? Can the return journey ticket too can be booked while purchasing the onward ticket under tatkal? You can book the return ticket in normal quota even if the onward journey is in Tatkal. It depends on the date, Tatkal can be booked only one day in advance. So irrespective of what quota you booked onward journey, whether you book return in Tatkal or normal it will depend on the date of travel and the day you are booking. Actually these steps are really helpful and thanks for it . I am trying to book the ticket from last few days , I start up with the confirm ticket but never could book the confirm ticket , website of IRCTC is too slow and when I get my ticket it becomes the wait listed ticket . It is really frustrating and also I am loosing my money as service charges and booking charges on each transaction . 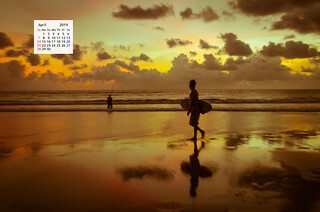 Is there any way out to book tatakal during these holiday and peak season ? Hi Ratan: Unfortunately I do not have a magic bullet for the same if you are following all the steps to book Tatkal ticket online then you will get success. We can not control the speed and bandwidth of IRCTC servers as thousands of people try to login simultaneously making the site slow. Try to be on a fast internet connection and keep all the information ready to increase your chances of successfully booking the tatkal ticket online. This is very useful and comprehensive piece…though I rarely book tatkal tickets but when I do…its a big hassle but I am sure…with this information, I will increase my chances of getting a ticket. Thanks. Half of my travel plans were never materialized because all the trains always run to their capacity and become full before 50 days. And with Tatkal, I didn’t have luck either. Very useful tips for booking the tatkal train tickets. hey , is it something that only 2 TATKAL tickets can be booked per IP … IF i want to book about say 7 ,then any tips, or could you pls help out!! Max you can book 4 Tatkal ticketsin one session per PNR number. 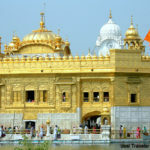 Thanks for the inputs Sweety, and welcome to Desi Traveler blog. I followed all the instructions as stated above, you told to login 10 min before. But when there is inactivity it says session expired and we have to repeat whole procedure again. So how to avoid this? I am sure I tried every possible thing to keep it active like clicking this that.. Still it gives me this message after a min or two. The site was unresponsive after 10 (error 503). After 20min I was successful when last 3 seats were left. Luckily I am travelling alone. So please tell me any alternative so that i can keep session active..
Hi Akshay… Congrats on booking Tatkal tickets. I think the only thing you can do it so keep clickng on different tabs to keep session active. The error 503 on IRCTC site for Tatkal is due to heavy traffic and users have no control on it. IRCTC need to increase there server capacities and bandwidth to avoid the same. I had been doing all above but failed to get tatkal tickets for a number of times.I think IRCTC has got its own ways to help the touts as even today ,touts are there to arrange for tatkal tickets for you , what is there modus oprerandi-best known to them or to their Godfathers:IRCTC. For a good number of times,I was able to book a tatkal ticket but when I pressed for payment , I got “SERVICE UNAVAILABLE;HTTP ERROR 503”.Any way ,railway claimed for its clean-neat getup but now it is in clutches and gears of CBI and IRCTC happens to be a concern of railways & on paper, it is committed for SUKHAD YATRA of passangers but infact ,it is not.I am waiting for the same fate of IRCTC as has happened with railways. i agree with your 0bservtion. Thanks Gowri, and welcome to Desi Traveler. I love your pics and posts about the King and other snakes..
Those are useful tips . Thanks. Thanks Rahul…A common problem faced by us all.. Most of us are facing issues with IRCTC website for Tatkal booking. You will find links to other similar posts in the article written by me. This is so damn helpful for the uninitiated! Hi. Useful post about booking tatkal tickets. Even using the IRCTC site for regular booking is a pain and frustrating experience sometimes, I can only imagine doing it for Tatkal. I wonder if logging in 10min before works all of the time as I’m sure thousands of others are probably doing the exact same thing, no?! Hi Neeraj: I am sure thousands are trying the same thing but if one is prepared with all the info to book Tatkal tickets online on IRCTC site chances of success increase. Its all a game of those 15 minutes in the morning.